an oui gib hour fankz 2 ceiling cat hoo watchez ober uz. Thx noodle! An thx 2 ower hoomin fur swichin teh wawm awn! Fankeez 4 rEmindiNg ussenz, noodle.Gudgudgud fing 4 awlluvus 2 rEmembrrrrr, aifinkso. Congaz 2 teh tawp spott laydee agin! gladd 2 heer alluv yore nyss birfday kawmintz yestiddy. Rgx TM! Yep it maed mai birfdai berree speshul! Mawm! Hii’s steelin mai heet! Mayk himz moov! To teh negst rum wud be gud. Teh heet duz um…emfasiez teh goggie smel! Ia kitteh sleepin onna negleejee’?? Well, it duz kina luuk liek teh NB, juss missin teh hawt tubz. Yup — maeks mee wunner wuts onna doze moobiez onna da tablol??!! This is my foster goggie Ginger and Jeffery sharing the heater. 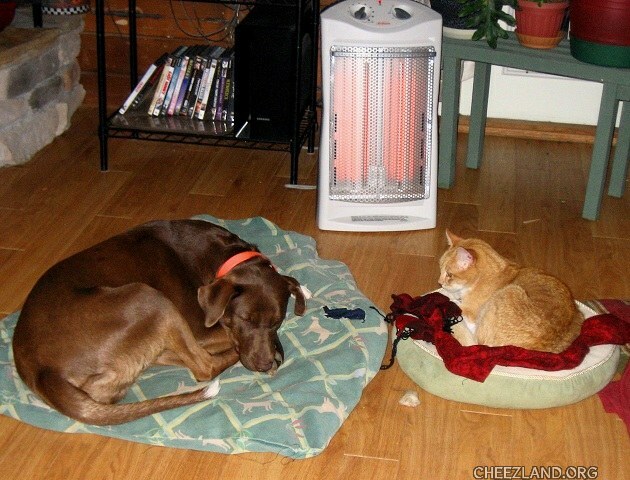 This is an example of a cold night makes for some strange bedfellows because Ginger is usually chasing Jeffery around the house. And that is my shawl that Jeffery insisted he must have…..